Bob Condotta of the Seattle Times has reported that there is “no specific timetable” for the return of Malik McDowell, who was drafted 35th overall by the Seattle Seahawks in the 2017 NFL draft. Defensive lineman McDowell was injured in an ATV accident prior to training camp, and has returned home to Michigan. 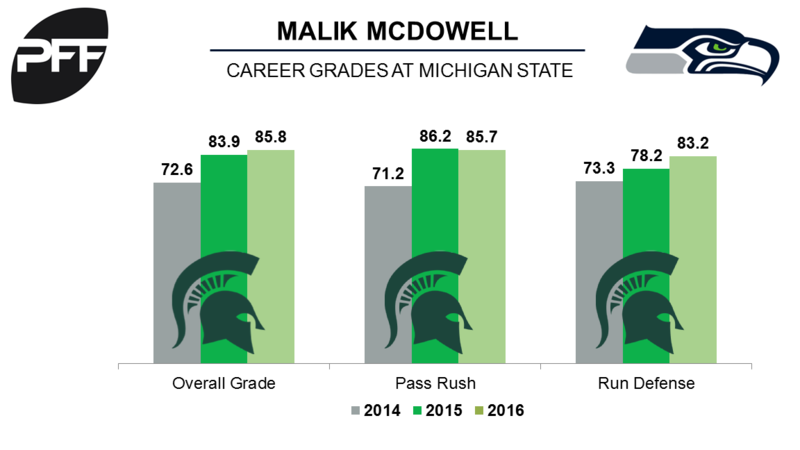 McDowell’s positional versatility was reflected during his tenure at Michigan State, where he performed well in both against both the run and the pass. His 24 run stops in 2016 equated to a PFF run-stop percentage (percentage of stops per snap played only in run defense) of 11.2 percent, ranking 13th out of 409 eligible defensive tackles (minimum 108 run snaps). He also recorded 30 total pressures, resulting in a PFF pass-rushing productivity (pressures created on a per-snap basis with weighting toward sacks) of 11.7, ranking eighth out of 361 (minimum of 120 passing snaps).